A little paradise on the Emparis plateau at 1540 meters. A step not to miss on the GR 54 "Tour de l'Oisans" in the Ecrins National Park overlooking the Meije, not to mention the welcome of the guardian ! du Chambon before climbing up across the meadows. From there, it is possible either to follow the trail to the right that joins the refuge (adding ½ hour), or to carry straight on directly to Les Clots. Along the way, and near the refuge, depending on the time of your visit, you may see marmots, chamois and butterflies, and depending on the season, feast your eyes and nose with lavender and other orange lilies. You’ll also have a chance to admire the waterfalls surrounding the hut, gushing out of a petrified fountain, forming concretions of tuf. The site is under a biotope protection order, so please stay on the path to avoid damaging this geological wonder. - Circular walk to the Plateau of Emparis and back to Les Aymes (4 hours - height gain: 660m). - The Lac Noir and the Lac Lérié on the Plateau of Emparis (height gain: 900m). - Beautiful hike across the Plateau of Emparis to Le Chazelet. Wall of the Cascade de la Pisse: 4 climbing routes from 5c to 7a (300m) which lead to the refuge (see « Oisans nouveau, Oisans sauvage » by JM Cambon). Via Ferrata of the cascade de la Pisse, looping through the refuge. 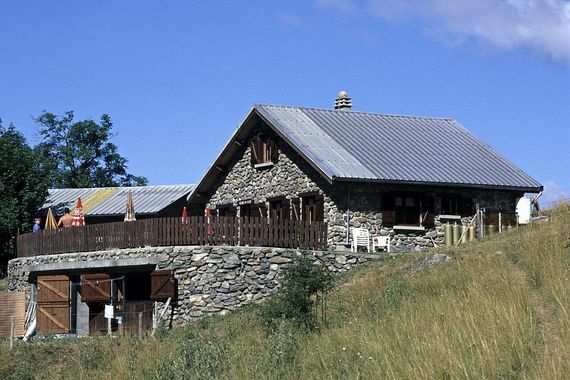 Juste next to the refuge, a cabin has been converted into an ecomuseum : its visit willmake an ideal end to your passage through the discovery trail, and you will know everything about the flora, fauna, and life in the Emparis pastures. The easy access to the hut and its surrounding environment make it an ideal choice for a first overnight stay with children or for meeting up with friends. Picnic to take away: 9 €. From the car park at les Aymes, follow the path marked in red and withe (variant of the GR 54 path): the balcony trail makes its way above the lac du Chambon before climbing up accross the meadows. From there, it is possible either to follow the trail to the right that joins the refuge (adding 1/2 hour) or carry straight on directly to Les Clots.